Diabetes is life-changing, but your child can live a full and active life with the right care and management. Children’s has the expertise, support and tools to make it easier. When your child has diabetes, it’s important to work with a team that specializes in pediatric diabetes care. Your child’s specialists know how diabetes can affect kids’ bodies. They also know how to put kids and families at ease—and how to encourage preventive care and self-management to prevent complications. Every day, more than 6,000 children and young adults in Georgia with diabetes go to school, play sports, have friends and do pretty much everything they did before they found out they had diabetes. Children's sees about 400 newly diagnosed patients with diabetes every year, caring for nearly 4,000 families. Plus, our Diabetes Education Department has been recognized by the American Diabetes Association (ADA) as meeting the National Standards for Diabetes Self-Management Education since 2004. We can help your child balance the daily demands of blood testing and preventive care with the challenges of growing up—and you will have the information and support you need to help your child get on track for the healthiest future possible. 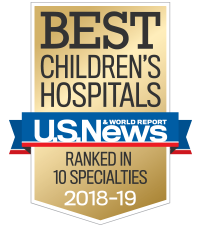 We are also working with other organizations, such as Emory University, Georgia Institute of Technology and the Centers for Disease Control and Prevention, to create a world where kids with diabetes spend less time worrying about treatment and more time being a kid. We worked with the ADA and Georgia legislators to get Safe at School legislation passed in Georgia, requiring every school in the state to train at least two employees in diabetes care. And we worked with the Georgia Association of School Nurses to train more than 200 school nurses across the state, so they can return to their school districts and train school staff on proper diabetes care. Because diabetes is a complex condition that affects the whole body, we work with other specialists as needed to provide coordinated, comprehensive care. We also draw from resources and services across Children’s and the community to give you and your child all the care and support you need. Type 1 diabetes is also known as insulin-dependent diabetes mellitus. It is the most common type of diabetes found in children and young adults. When a child has Type 1 diabetes, his pancreas can no longer make insulin. The immune system gets confused, and attacks and kills the pancreas cells that make insulin, rather than recognizing them as a normal part of the body. About 1 in 7 people with Type 1 diabetes will have a family member who also has Type 1 diabetes. Children who have Type 1 diabetes can stay healthy by taking insulin injections every day. They can become very sick and even die if they cannot get insulin. Type 2 diabetes is sometimes called non-insulin-dependent diabetes mellitus (NIDDM). Until recently it has mainly affected adults. Today, Type 2 diabetes is becoming more common in children. Most children with Type 2 diabetes have a family member with Type 2 diabetes. Unlike Type 1 diabetes, the immune system has nothing to do with Type 2 diabetes. Type 2 diabetes means that your child's body has a resistance to insulin. The body doesn't use insulin in the right way. Even though many children take medicines or insulin injections to treat their Type 2 diabetes, the most important part of treatment is to eat right and be active. Cystic fibrosis is an inherited disease that affects the lungs, and it also causes pancreas problems. If the pancreas does not make enough insulin, diabetes can develop. Or your child's body may have a resistance to insulin, which means it doesn't use insulin in the right way. Even though cystic fibrosis-related diabetes does not always cause symptoms, it usually needs to be treated with insulin injections. Some medicines, such as steroids, can temporarily raise blood glucose levels. People with diabetes will almost always need to change their diabetes treatment when they take steroid medications. Diabetes insipidus occurs when a hormone that controls urine production cannot be made or cannot work in the kidneys. The hormone is called anti-diuretic hormone, and is made in the pituitary gland. Diabetes insipidus can cause many symptoms of other forms of diabetes, but blood sugar levels are normal and the pancreas is not involved. This form of diabetes means that a woman’s blood glucose is too high during pregnancy. The mother’s high blood glucose levels can cause complications in the baby. Most often, the baby will be bigger than usual—birth weights can be more than 10 pounds. Mothers who have gestational diabetes are at a high risk for getting Type 2 diabetes later in their life. Children who are born to a mother with gestational diabetes are at higher risk for being overweight and getting Type 2 diabetes when they are adults. The immune system of children with Type 1 diabetes sometimes attacks other organs besides the pancreas. Immune cell reactions against the thyroid gland are the most common and they can cause the gland to become overactive or underactive. The thyroid is a butterfly-shaped organ in the neck that controls the speed of everything in your body. When thyroid hormone is too low, things move slowly. When it is too high, things move too quickly. Celiac disease causes the intestines to react against proteins in grains, including wheat, rye and barley. Children with Type 1 diabetes are at high risk for having celiac disease. Symptoms can be severe, including slow growth and diarrhea. Some children with celiac disease do not know they have symptoms until after they are treated and realize how much better they feel. Cholesterol and triglycerides are types of fat that travel in the blood to all the cells of the body. Children with Type 1 and Type 2 diabetes are at risk for having high levels of cholesterol and triglycerides. If these levels are high for many years, they can raise the risk of heart attack or stroke. Usually, the only way to know if cholesterol and triglycerides are too high is to do a blood test. Some children need to take medicine to keep their levels safe. Some children and families have a hard time coping after a diabetes diagnosis. Counseling and other steps can help. Talk to your doctor about options to get help. The Teaching Kitchen in the Children's Healthcare of Atlanta Center for Advanced Pediatrics offers an encouraging wellness environment for children living with chronic illnesses. Classes are community-based and family-centered, and kids and adults can learn the health—and often cost-saving benefits—of preparing their own meals. Each class is taught by a chef, who is accompanied by a registered dietitian or educator, in addition to volunteers. Living with diabetes might seem overwhelming at first. After diagnosis, you and your child will have a lot to learn. Children's is here for you. We offer information, classes and other resources for you and your child, and we are always available if you have questions or concerns. Here are some resources to help you get started. Managing your child's diabetes: Self-care and preventive care are the key to preventing complications and living a full life. With our helpful tools and videos, learn what you can do to help your child stay healthy, learning and growing with diabetes. Camp Kudzu: Camping sessions, family weekends and teen retreats for kids with Type 1 diabetes and their families. The focus is on fun and sharing, and children and families can relax with others who understand their daily challenges. Patient family handbook: Download and print this handbook, and keep it handy. It includes information and checklists, as well as forms and charts that you can fill out to make managing diabetes easier. Classes: Children's offers several classes on diabetes and self-care for children and their families. For school nurses and daycare providers: Making schools and daycares safe for kids with diabetes takes everyone's cooperation. Children's offers information, classes and contacts to help teachers and other caretakers do their part. Whether you're a patient, family member, staff member or donor, if you're part of the Children's family, you play an integral role in making a difference in the care we provide for the many families that need our services. Please contact Angie Duprey for more information. Share your story and be part of ours. Recognize a staff member: Our staff is passionate about providing the best care for children with diabetes. Along the way, they build relationships with the entire family. We would love to hear about staff you encountered who went above and beyond. Make a donation: Our generous donors are dedicated to helping ensure children with diabetes receive the best possible care and the resources needed to succeed. As a Children's donor, you know your gift will be used to support advanced research, treatments and dedicated pediatric care for children with diabetes. Stay Strong4Life with this wellness program from Children’s. The College Diabetes Network for help handling college with diabetes. On March 25, 2019, treatment and services for children with diabetes moved from Children's at Meridian Mark to the Center for Advanced Pediatrics, located at 1400 Tullie Road NE in Atlanta. Children who are being treated for an endocrine condition other than diabetes will continue to receive care at Meridian Mark. This move does not affect our other neighborhood clinics.